Create a checkbox gadget in the current GadgetList. Text$ The text to display next to the checkbox. #PB_CheckBox_Right     : Aligns the text to right. #PB_CheckBox_Center    : Centers the text. 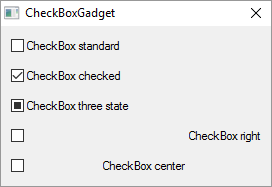 #PB_CheckBox_ThreeState: Create a checkbox that can have a third "in between" state. The #PB_CheckBox_ThreeState flag can be used for a checkbox that represents the state of multiple items. The "in between" state can then be used to indicate that the setting is not the same for all items. By clicking on the checkbox, the user can bring it back to either the "on" or "off" state to apply this to all the items. Therefore the "in between" state can only be set by the program via SetGadgetState() and not by the user by clicking on the checkbox. - GetGadgetState() can be used to get the current gadget state. - SetGadgetState() can be used to change the gadget state.